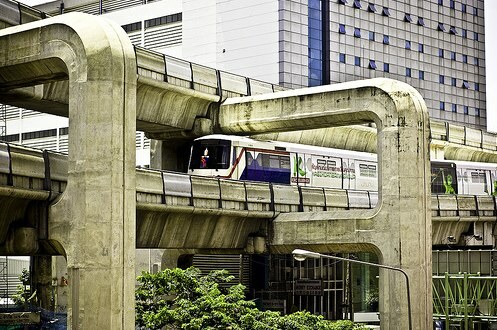 Electric railway system in Bangkok. Photo by SpAvAAi. Lew Fulton of the International Energy Agency made a very compelling presentation at the most recent BAQ Asia Conference. Asian developing countries exert large pressures on energy consumption and carbon dioxide emissions, mainly due to motorization in China and India. Changes in the transport sector are necessary to reduce global CO2 emissions. These measures could include things like modal shift from private vehicles to public or non-motorized transport, or developing cleaner fuels and vehicles, which are estimated to contribute to reductions of about 10 Gigatonnes per year. Biofuels will play a relatively small role. Therefore, efficiency is key in conventional and hybrid vehicles. Savings from avoiding motorization are gigantic. If the modal share of transit is kept above 60 percent on average, CO2 emissions will reduce by 5 Gigatonnes per year, as opposed to the business-as-usual scenario, where transit will account for only 30 percent of total trips by 2030. New fuel standards take time to generate benefits, and given that motorization rates are rising quickly, the net result is a very high increase in fuel use and emissions. Simply creating and enforcing efficiency standards will not do the trick. Transport, Energy and CO2 in Asia: Where are We Going and How do We Change it?